Roman Zaragoza has certainly left its mark on the city as any excavation is invaribly halted for a year or two as constructors "trip over" yet another Roman ruin! In the lead up to the Expo in 2008 works on the newly designed road network had to be changed drastically to a one way sytem due to yet more Roman ruins being found. This after half the roads were already built! To understand the connection to Roman Zaragoza its important to understand Zaragozas history. In 15 B.C., when Emperor Cesar Augusta had won the Cantabrian wars, Zaragoza was founded although at the time it was named Colonia Caesaraugusta in honor of the Emperors victory. Yet it wasn't until the 1st and 2nd centuries AD that the city began to flourish with the construction of a typical Roman forum next to the river, which became the principal trading center of the region due to its excellent connections via the Rio Ebro. Parts of Zaragozas Roman forum are visible today underneath the modern day central square, the Plaza Pilar. Zaragozas Roman wall however, didn't come along until the 3rd century AD when the begining of the decline of the Roman empire turned the attentions of city govenors to defence rather than trade. 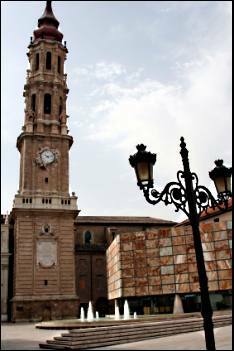 The footprint of modern day city center Zaragoza is directly on top of Roman Zaragoza so its possible to walk between all the monuments in a morning, or an afternoon, and can be considered a good half days activity. Of course, if you stop to try the tapas, your eye wanders to something else thats interesting or you lose your way (nigh on impossible) then it can stretch to a whole days activity! The Roman walls are free but are included in the Zaragoza map and walking route that comes with your ticket. The small Roman museum is located inside the forum and contains a number of artifacts, renditions of Roman life and parts of the forum itself. The Theater and baths are simply the ruins although you are able to explore them. 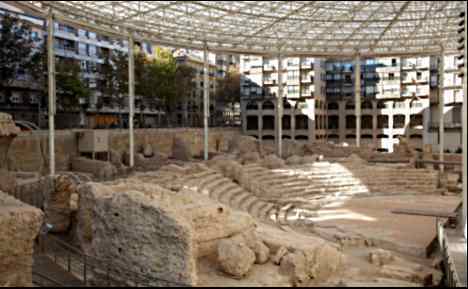 All of Zaragozas Roman ruins and the Roman museum are specialy adapated to provide full Disabled access.